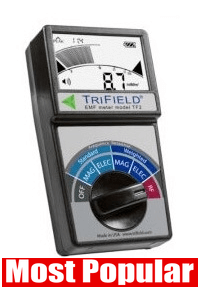 The TriField TF2 Meter can measure 3 types of EMFs: radio frequency radiation, magnetic fields and electric fields. Pros: 1)Easy to use. 2)Tri-mode - it's like having 3 EMF meters in one. 3)Good sensitivity overall. 4) Has sound function. Conclusion: It's a good choice if you're wanting an easy to use meter to measure EMF pollution in your home and work place. Instruction sheet and 9V battery included. 1 year ltd warranty. Made in USA. This meter replaces the Trifield100XE .